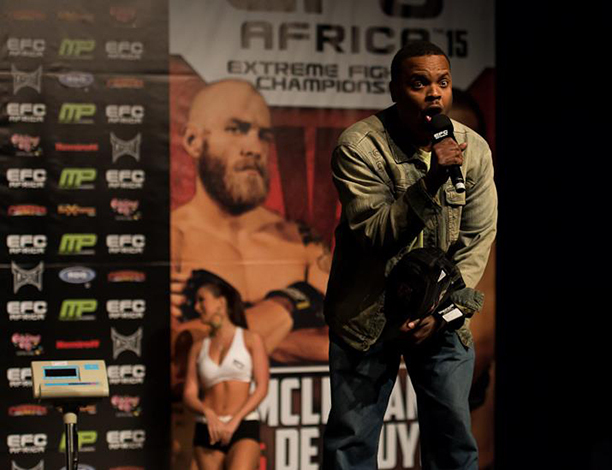 Johannesburg (South Africa) – The official weigh-in for EFC AFRICA 18 starts today at 13:45 (CAT). Get the adrenaline pumping for fight night by watching Africa’s best MMA athletes stepping up to the scale. The weigh-in is taking place at the Mardi Gras Theatre, Carnival City from 13:45. Entrance is free. Come and support the athletes and feel the tension as they stare-down during their face-offs. Weigh-in is where all the action begins. With intense stare-downs, mental intimidation and a tense spectacular, some believe that around the scale is where the fights are won and lost. Each athlete will try and put their stamp of authority on their opponent, so come and show your support and be part of the action! If you can’t make it to Carnival City, catch all the action online. The EFC AFRICA 18 weigh-in video will be available on efcafrica.com at 18:00 (CAT).